A classic button-front dress in a simple, modest design. 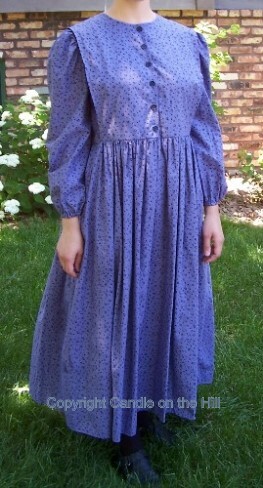 Dress has button-front bodice (snaps, pins, hook & eyes, etc. could also be used), simple bust darts for gentle fit, choice of collar or plain neckline, pocket option, full skirt that could be gathered or pleated, and choice of elastic or non-elastic waist. 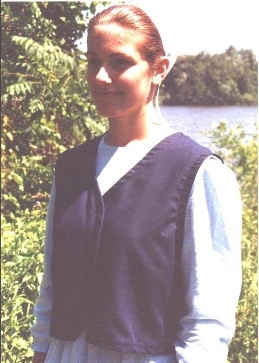 Front button closure is helpful for nursing mothers, especially when you add one of our vest or apron patterns for extra coverage. This is a well-loved dress, and our best-selling pattern. From the Candle on the HillTM collection of sewing patterns. Includes Ladies Sizes Small-XXLarge! About Candle on the HillTM Patterns: Our patterns are hand-drafted and drawn, with lots of love, care and prayer, in the tradition patternmakers have used for centuries before the advent of modern computer software. Then the patterns are printed on paper, not tissue, for a longer lasting pattern. Each pattern includes instructions and sewing tips, and come to you in a handy resealable storage envelope. A special insert is also included with some ideas of more options for your Candle on the HillTM ladies dress pattern, including how to modify your pattern to Make-it-MaternityTM! !